If you’re looking for a fun day out for the whole family, then look no further than Aussie World, a fun theme park on the Sunshine Coast. With coasters, slides, water rides and mini-golf, there are over 30 attractions to keep your kids busy all throughout the day. Located on the Bruce Highway, just one kilometre north of the Caloundra exit, Aussie World is centrally located and easy to access during your stay on the Sunshine Coast. Bring your own lunch or grab a bite at the Aussie World Cafe which has a wide and varied menu including hot dogs, burgers, fish and chips, wraps, salads as well as some gluten-free options. There is a huge range of fun rides at Aussie and their all-inclusive ticket price means that you can go on each ride as many times as you like throughout the day. Ballroom Blitz: A huge swing which has you soaring 15 metres in the air as you rock and spin. Redback: Strap yourself in as you are spun around on this unique thrill ride. Bug Run: A roller-coaster especially for kids which winds its way through a fantasy garden. Ferris Wheel: Giving you the best view of the Sunshine Coast and nearby hinterland region. Giant Slide: A 46 metre long, 15-metre high super slide which will have you speeding to the bottom in no time. Plunge: Step inside a hollowed out log and plunge down a ramp at great speed, a great way to cool off on a hot day! Wild Mouse Rollercoaster: With of twists and turns, this roller coaster has plenty of nail-biting dips. There is plenty for little kids too with the Tin Lids Tea Party ride, Carousel, Tykes Trolley and the sideshow alley. 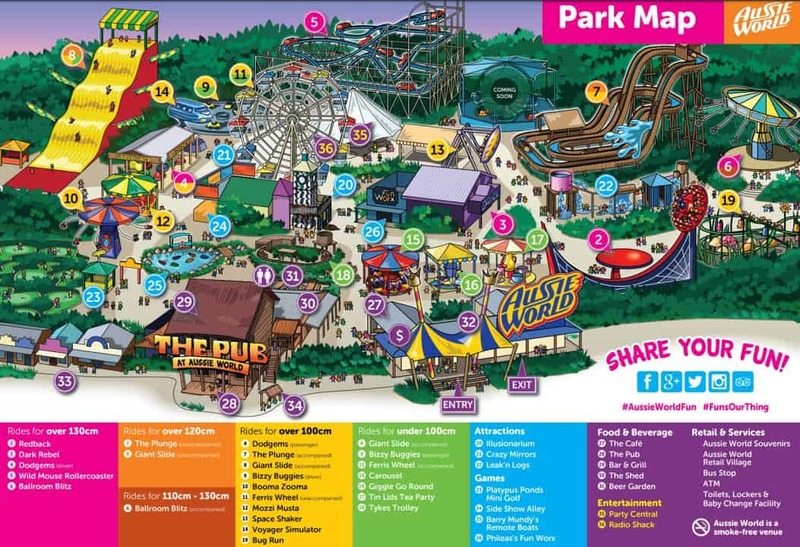 If rides aren’t your thing, check out the range of other activities at Aussie World including; Professor Bogglesworth’s Illusionarium, Crazy Mirrors, Leak’n Logs, Phileas’s Fun Worx, Platypus Ponds Mini Golf, Side Show Alley, Stockshed Speedway Dodgems and the Voyager Simulator. Click on the link below to buy your Aussie World tickets online today! Discounts are available with the purchase of season passes. Yes, there is a discount offered if you purchase a Family Ticket (2Ad + 3Ch) for $175 and one extra children’s ticket for $40. This will total $215 and will save you $25 rather than purchasing each ticket separately. You can purchase the tickets here. Make sure to select the 2Ad + 3Ch Family Ticket for $175 plus one child’s ticket. I hope they enjoy their Christmas present. Have a great day! Hello, Can you please tell me if ticket prices includes rides? Yes, with your ticket purchase you get unlimited rides in the park and unlimited mini golf games. You can buy tickets online here. Have a great time at Aussie World! Once you paid to get in does this cover the cost of all rides and shows etc? Also, what rides will be closed this Sat 16th July? The admission price includes unlimited rides and all attractions including Mini Golf, the Illusionarium as well as shows and entertainment on weekends and school holidays. Coin operated and skill games such as Side Show Alley, Barry Mundy’s Remote Boats and Phileas’s Fun Worx are at an additional cost. Currently the Mozzie Musta and the Wild Mouse Rollercoaster are under maintenance. All other rides are open. You can purchase your tickets to Aussie World here. I hope you have a great day! Hi, Is it unlimited entry? A ticket to Aussie World gets you in for 1 day only. Once inside, all rides are free and you also get access to unlimited mini-golf. You can purchase your online tickets here. Enjoy your day at Aussie World! The vouchers are valid for 12mths from the date of purchase. You can purchase tickets here. Enjoy your time on the Sunshine Coast!